These are sticky to work with, so I recommend chilling the mixture for at least 10 minutes before forming them. I tried one (for quality control’s sake *wink*) and they were really tasty. The peanut butter flavors this nicely and they’re only slightly sweet. 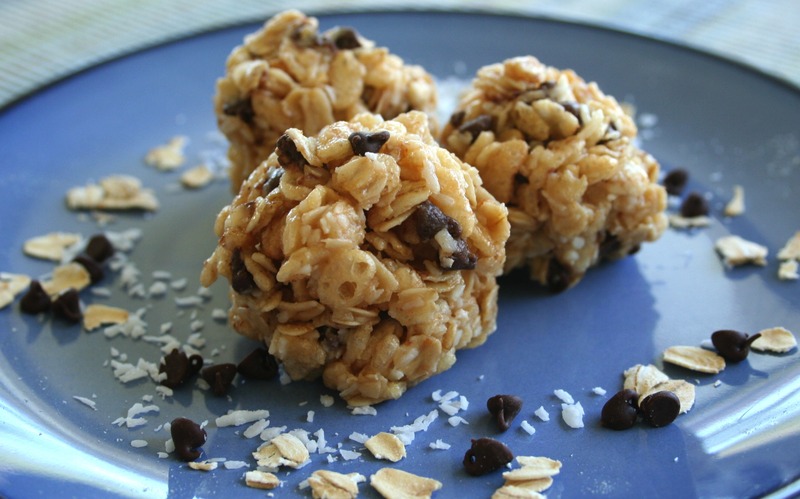 The mini chocolate chips are a nice addition, the coconut and oats give these a nice chewy texture and the rice cereal adds a pleasing crunch. 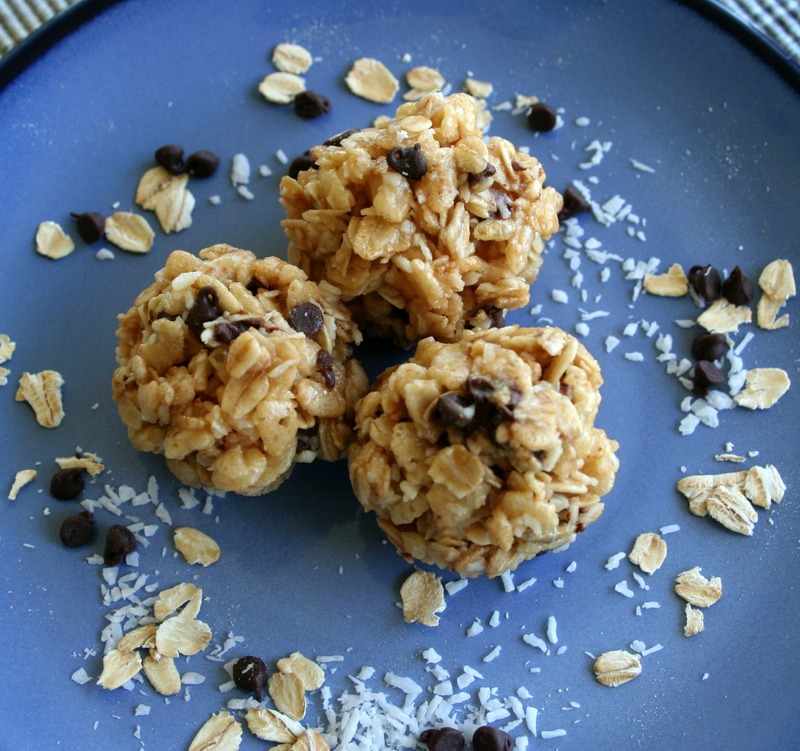 I was afraid the uncooked oats would make these hard to eat but I was pleasantly surprised. I will make these again, but maybe in bar form. The bites wont make good lunch box snacks, but rather after school snacks because they fall apart easily. Maybe it’s because of the humid climate that these never set up tightly, so I serve these straight from the fridge. I placed the ball in a muffin paper so the kids’ hands wouldn’t get sticky. Thanks for reading, enjoy! 1. In a small saucepan over medium heat, stir together the maple syrup or honey, peanut butter and butter. Heat until the butter is melted and the peanut butter is loosened. 2. Combine cereal, oats and coconut in a medium bowl. Pour the warm peanut butter mixture over the dry ingredients and fold tom combine. Stir until all of the dry ingredients are moistened by the peanut butter mixture. Allow the mixture to cool a bit for easier scooping. Mix in chocolate chips if desired. 3. Using a small scoop, scoop mixture onto a wax paper lined baking sheet. Press balls together with clean and damp fingers if they break apart a bit. Place in the fridge for about 15 minutes to harden and set. Place balls in cupcake liners and store in an airtight container in the fridge for up to a week. Makes about 24 bites. Ooooh, these are cute and look so lovely.